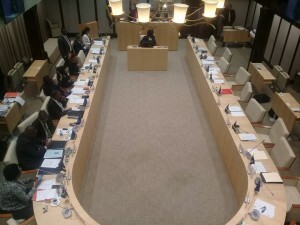 WILLEMSTAD – With eleven votes for and five against, Curaçao’s Parliament late Friday night adopted a motion calling for the withdrawal of the national decree issued by the outgoing Koeiman Cabinet to dissolve the legislature and call early elections on April 28. The “new majority” comprising the MFK, KdNT, PS and MP fractions plus independent parliamentarians Eduard Braam (ex-PAR) and Gassan Dannawi (ex-MAN) said the decree was in contravention of the European Human Rights Treaty. The MAN-led caretaker government is to withdraw the decree today, Monday, at the latest. However, the decree has been signed into law by Governor Lucille George-Wout and published. Moreover, preparations for the elections are well underway. Parliament will resume the meeting on Tuesday at 1:00pm to see whether its motion has been executed. If not, the Governor will be asked to send the decree up to the Kingdom Council of Ministers for annulment. In the meantime, the Koeiman Cabinet has approved a budget of close to NAf. 2 million to organise the election as scheduled. The money has been transferred to the Supreme Electoral Council, which has already started the process of ordering the voting cards and ballots. Nomination Day to hand in the candidate lists is this Friday, March 10. A first meeting with interested parties is planned for today, Monday. One of them is likely to be “Partido Aliansa Nobo” (PAN) of Amando “Broertje” Rojer, son of long-time union leader Hubert “Bèbè” Rojer. He says they will try again, following failed attempts in 2012 and 2016, to get the necessary voter support in pre-elections for parties without current representation in Parliament to qualify. A new party named “Pueblo Uni Solidario i Hustu” (PUSH) has been announced by media personality Ydelliennne Heerenveen. She is also known for the women’s organisation “I AM A B.I.T.C.H.” (Beautiful Intelligent Trustworthy Caring Human). In all of this the proposed “formateur” of the MFK-led majority, former PS Minister Ruthmilda Larmonie-Cecilia, is yet to be appointed by the Governor. The intention up to now was for her to form an interim cabinet to govern the country until the next government takes over following the early elections. Some have questioned why her screening process seems to be taking so long when she was already screened to become a Minister. Although Larmonie-Cecilia cannot formally start her work as such, she did approach the political parties forming the new coalition to see what their intentions are and which candidate-Ministers they would like to propose.